Jo S: A confession, my friends… I have a crush. I’d thought it was just the massive purple craggy jaw, the gigantic fists, the sturdy boots but, no, it turns out that Josh Brolin is the morally questionable, ethically fluid Marvel giant for me. As Cable, he is yet, I think, a little underused in David Leitch’s vision for the second coming of Deadpool but then, you know how I love a cyborg! 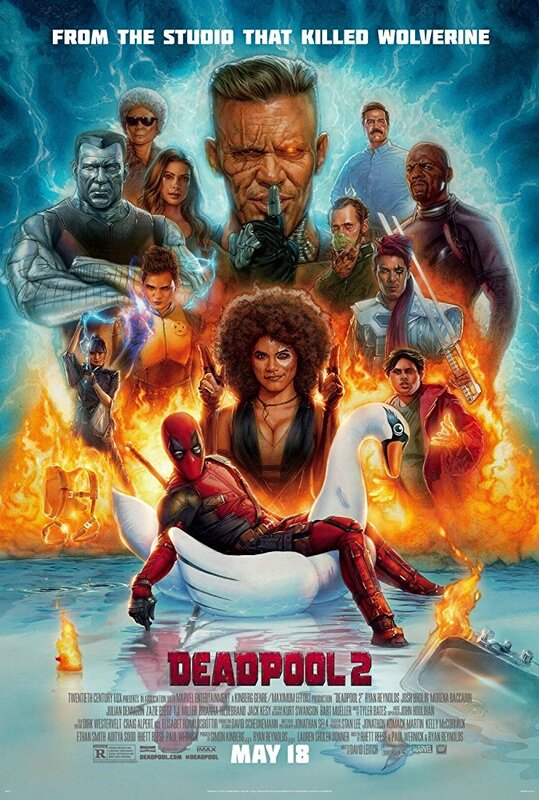 Deadpool 2 offers everything you’d expect from a sequel to the fourth-wall busting first movie - a little romance, a whole lotta fighting and a machine-gun paced spew of comedy, poking fun at everything from the mysterious lack of X-Men in the movie (riffing on the original movie’s dig at the same issue) to niche jokes just for the uber-geeks. Okay, so the story was nothing new (I’m not even going near the time-travel thing); hero suffers tragic loss, teams up with kid who’s a victim of bullying, hero learns to work with a team, there’s a grumpy old time-travelling dude, yada yada yada… but you don’t come to Deadpool 2 for the complex plot or dark intrigue, do you? You come for the action, the comedy and the swearing, and DP2 has all of these in spades. Director David Leitch’s background in stunt work is evident in the near flawless action throughout - even when Wade Wilson’s body is being mangled to the point of being unrecognisable as human, the fighting feels legit; the chase scene, where we see Domino’s superpower come into play, is tight and totally credible, even in its impossibility. And, ah, Domino! Zazie Beetz entirely steals every scene she is in, sauntering in and out with impractical levels of cool; give that woman a movie of her own! Negasonic Teenage Warhead and her new love-interest also do a great (though all-too brief) job of putting Wade in the shade temporarily. Of course, the ‘Pool Boy comedy-ometer is turned up to eleven - the guy sitting next to me was struggling to breathe at several points during the movie, with the antics of The Vanisher bringing him close to tears at one point. Reese, Wernick, and Reynolds have taken every joke ever invented about, ahem, rear-end action and crammed them all into… well, I’m not even going to finish that sentence. But it is smart too - Deadpool is surely the ultimate master of the devastating one-liner and the script really does him justice on this. Reynolds embodies the Merc With A Mouth to the point where it has become really hard to imagine anyone else in the suit. It’s a Marvel movie, so it goes without saying that the post-credits sequence is worth the wait, although, astonishingly, someone in our viewing still bounced out of their seat as the first names started to roll - don’t do this, kids, don’t be that guy! I’m going to need another viewing, probably after a longer discussion with the PCG team, to catch a few more of the lovingly placed easter eggs too.